Hello. I do think it rather a pity that this monument is not available to view on the internet. The internet can do one of two basic tasks namely that it can whet ones appetite into actually going to see the place of homage, or it can bring that place of homage to those, who for whatever reason are unable to travel and visit it personally. It cannot be found on its owners site, the Royal British Legion, not even by name never mind a photograph. Nor can it be found on the HMS Ganges Association web site or the HMS Ganges Museum Website where its absence is total, except that there is mention under Activities that Brian Coward is the activity representative for the Memorial. It is however, on the old HMS Ganges Association website, the one constructed by the erstwhile and much missed Clive Watts, but that site will eventually disappear from view probably early in the new year of 2010 on its first anniversary of being unvisited by its webmaster and therefore considered abandoned. What follows on this page is copied from Clive's excellent site. I have another page on this site into which I have copied Clive's salutation to HMS Ganges' Victoria Cross holders, yet another subject ignored by the current webmaster post February 2009. Here then is an excellent description of our Memorial as explained by Brian Coward, who for a long time gave it his best shot and came up with a Memorial of which we are so proud. After what has seemed - to me - to be a very long while, I am extremely pleased to report that the HMS GANGES MEMORIAL is completed. This is what it looks like. The H.M.S. GANGES MEMORIAL is sited at the back of the Royal Naval area, which adjoins the Merchant Naval area. Its actual position is at the end of a row of Merchant Naval shipping lines memorials. 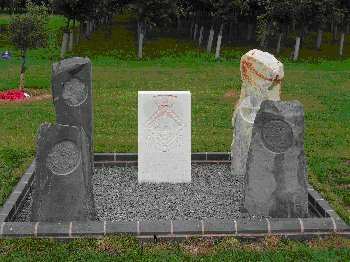 "THIS MEMORIAL IS DEDICATED TO THE MEMORY OF ALL WHO PASSED THROUGH H.M.S GANGES AT SHOTLEY IN SUFFOLK BETWEEN THE YEARS 1905 AND 1976." The edging of the memorial is constructed of Staffordshire Blue Bricks, raised a little above ground level. Within the inner floor of the memorial is scattered a Greeny/Bluey (colour dependent upon the light/weather etc.) Shale. This represents The Sea! A brief write up of the function and history of H.M.S. Ganges (as a Shore Establishment training Boys for the Royal Navy) has been provided to The National Memorial Arboretum. This will be included within their guide in order that readers are aware of what this memorial commemorates. The Memorial has been constructed so that it should be 'maintenance free', with the wind and rain carrying out cleaning duties for us. It had to be this way because we will all be gone in the not too distant future! Organising 'Cooks of The Mess' was just not practical! Planning is in hand for a Dedication Ceremony to be held at The Arboretum for the Memorial. It will not be until - at the very earliest - 2008 and then, probably when the good weather is with us!!. The H.M.S. GANGES Association's Committee have this task in hand and details will promulgated when arrangements are made. I trust the above gives all readers an insight into what I have been up to over the last three years. Personally, it has been for me, a very interesting time, allowing me to rub shoulders and talk to, craftsmen whom I would never have met had it not been for this project. As an ex-Ganges Boy, I am proud to have been instrumental in the creation of this memorial, which will ensure that long after we have gone, the memorial will let people of future generations know that H.M.S. Ganges was there and served its country well. In the coming weeks, hopefully before the end of November 2009, I hope to publish a short video of the Memorial on this page. Today is the 28th of November 2009 and yesterday, Friday the 27th, I visited the National Memorial Arboretum [NMA] to take the short movie I promised above. However, my visit merits a new page of its own and so please click HERE to view that page.